Before making a gravy from pan drippings, it’s best to skim off the fat that has accumulated—a process known as degreasing. Degreasing is simple to do and ensures that you get the full flavor from the sauce or stew. Thankfully, fat naturally separates and floats to the surface, making it easy to remove. To degrease pan drippings from a roast, first remove the meat from the pan. The clear fat will rise to the top while the darker flavorful juices that you want to keep will settle to the bottom. Tilt the pan gently so that the pan juices and fat puddle in a corner. Don’t stir or slosh the liquid or you’ll have to wait for the fat to float to the surface again. 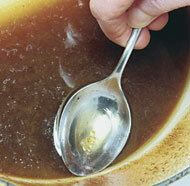 Dip a spoon into the liquid just enough to allow the fat, but not the juices, to spill into the spoon. Keep tilting the pan so the fat layer stays deep and you can spoon it off.